Now that all the peaches are off the tree, I’ll soon run out of them. And I’ll have to find something else to post recipes about! But before that ends, I’ve got one more. 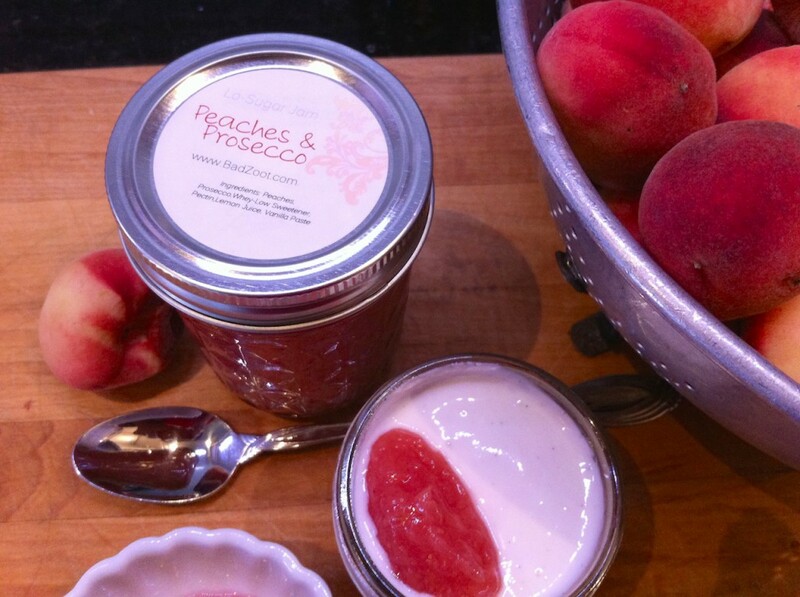 You know I like to put food in jars (I also like that blog too!) and these little gems need to be used. Going through my food files, I see much of the same,…peel peaches, chop, make syrup…whatever – BORING. Wait, I remember something I’d bought a long time ago to fill some fancy thumbprint Christmas cookies with, peach jam made with champagne. 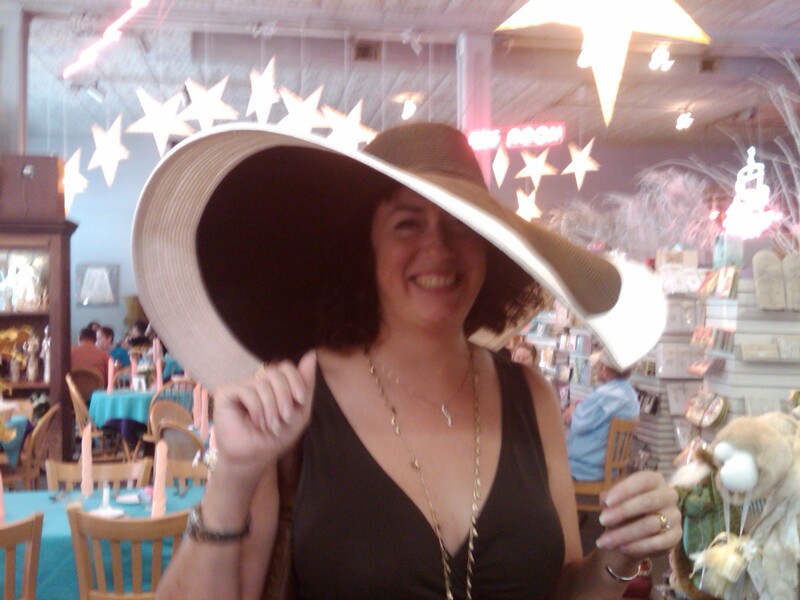 It was expensive – and special – and it’s gone! 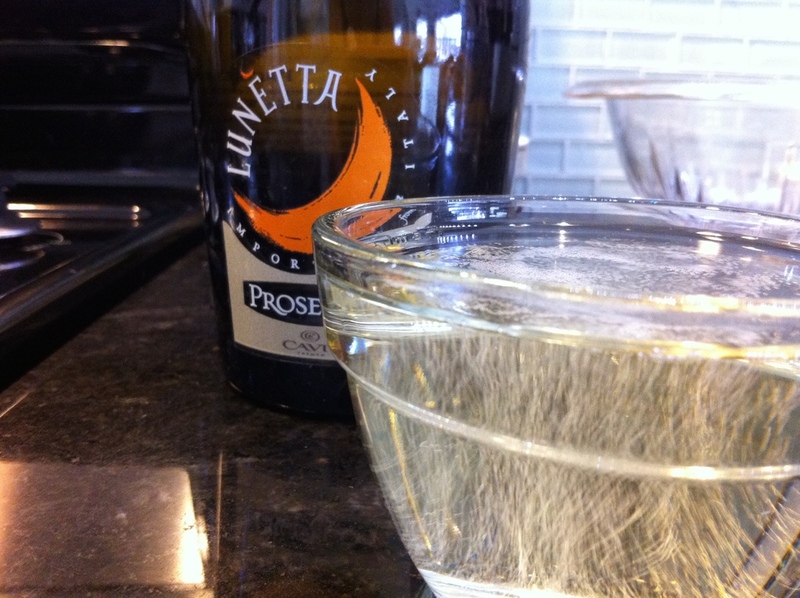 Off to the liquor cabinet, no champagne…but I do have Prosecco. That’s even better, like Italian champagne. I keep it for company because everybody loves it. Bubbly, and not-too-sweet – oh, yes, that’ll do. Now I need to do some research. Once again the Net and my books start every recipe with ‘get thee a gigantic cauldron of boiling water,…peel the peaches,…’ (wow, I’ve got some really old cookbooks!) These are the size of plums and I’m lazy – besides, what’s wrong with the peels? Do they ruin the jam? What gives? Come to find out, it’s one of those hold overs that people just keep doing, year after, year – generations of boiling water, naked fruit, and their accompanying blisters. Of course, they may not have had that new innovation called ‘The Food Processor’. I like most peels, and I’m sure there’s some nutritional value there. I’m keepin’ em …and I may have mentioned, I’m lazy. Step 1: Before we get started, preheat oven to 250deg., go and check your equipment – 12 – 8oz jars/lids, a cookie sheet, a scoop, and funnel. Put a couple of teaspoons in the freezer for testing. 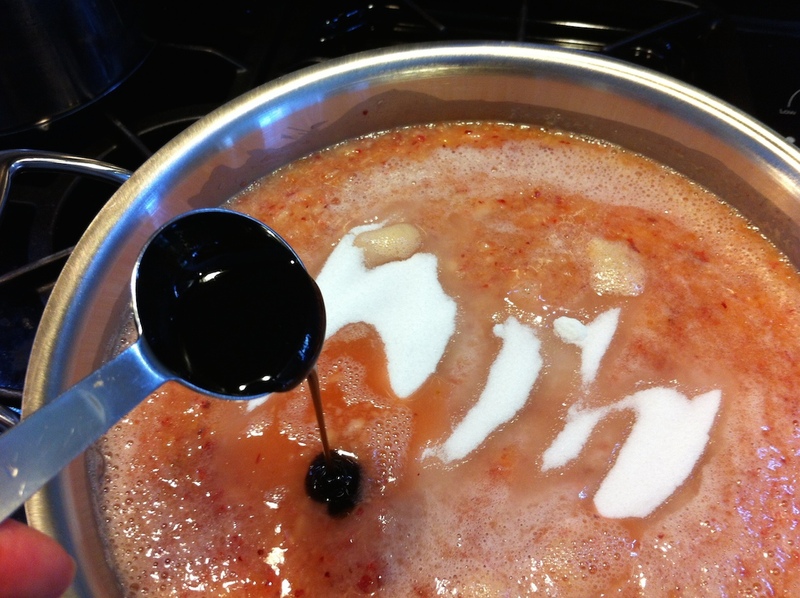 Also, a pot of boiling water for the scoop and funnel to sterilize. 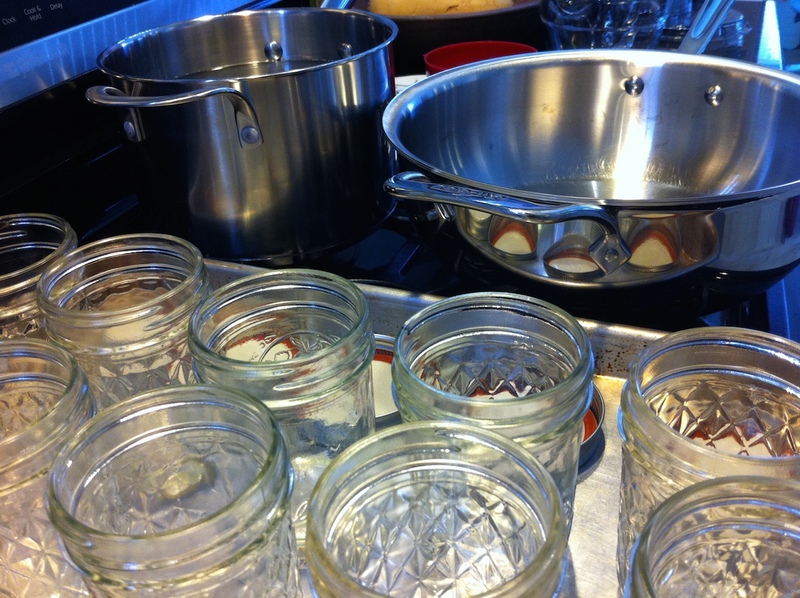 Load the clean jars in the oven for 30 min, while you make the jam, to sterilize. 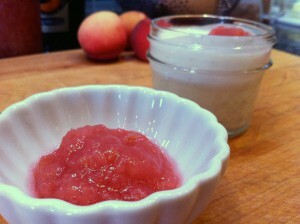 Start with 8 cups of peach puree – this will vary with the size of your peaches. Mine, I cut into relatively uniform size and loaded them, peels and all, into the Cuisinart for a spin. Puree the peaches in the food processor. – A few larger pieces are fine – be sure you don’t liquify them though. 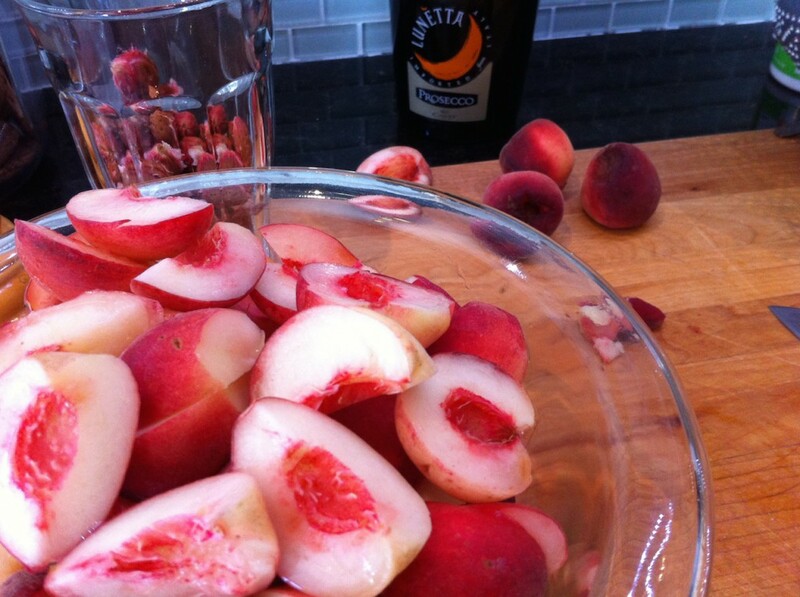 The white flesh peaches and their peels make it pinky – so pretty! 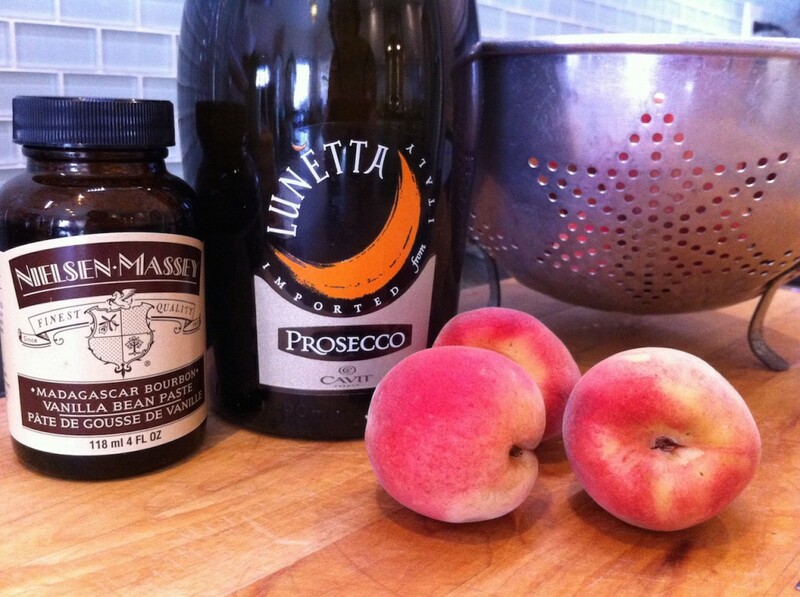 Add the prosecco – it’ll bubble up quite a bit. If you’re on a gas stove, turn on the burner AFTER the wine goes in. Now get them simmering. Ahh the bubbles – and some leftover for a mimosa! Now that it’s simmering, the color has really changed. You can skim off the foam – it’s not very appetizing in the jars. 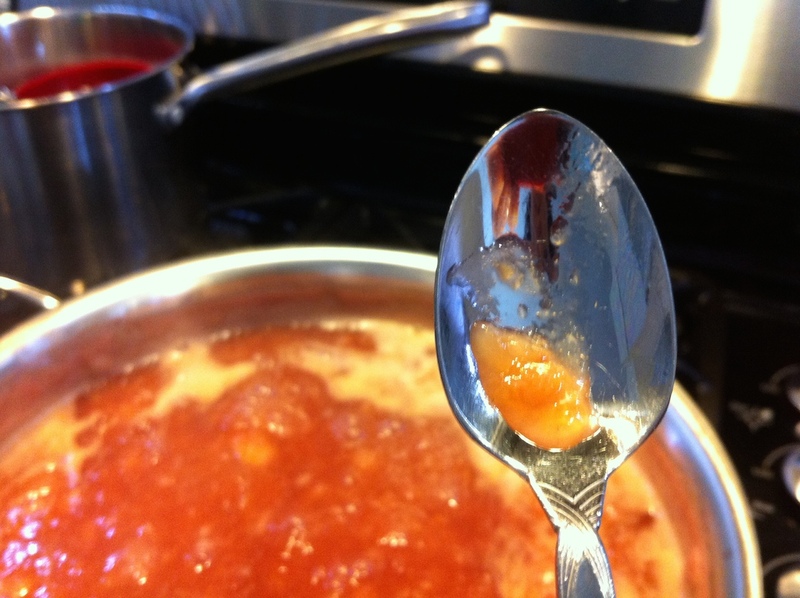 Get one of those spoons from the freezer and take a tiny bit of jam on the end. If it doesn’t run off the spoon, you’re good. If it does, then it needs to cook a bit longer. OK, now we’re ready to jar. 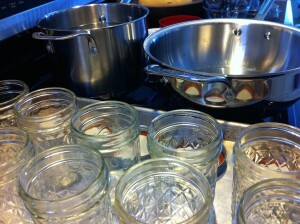 You know the drill: fill each jar to the shoulder (bottom rim), wipe the rims, and lid, finger tight. Put them back in the oven at 250deg for 30 min. to ‘process’. Now go and makes some sweet labels on your computer while they cool. Avery has templates online for their labels. That’s it – this is a healthy luxury item. No, really – there isn’t much sugar in it, and it’s mashed fruit ! And that color – WOW. No, you won’t see that on a store shelf near you. Well, maybe a pantry shelf – yours that is. Luxurious and healthy, a win-win ! 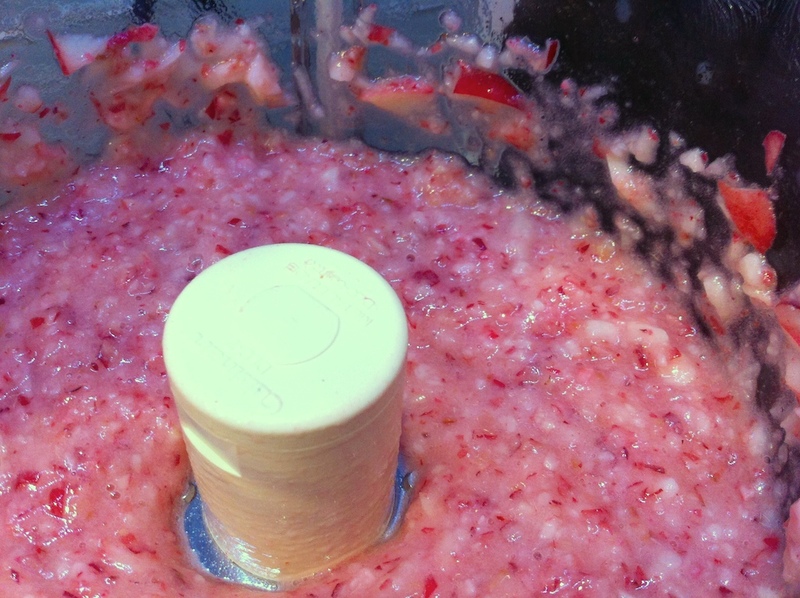 Make up the puree, in a food processor. 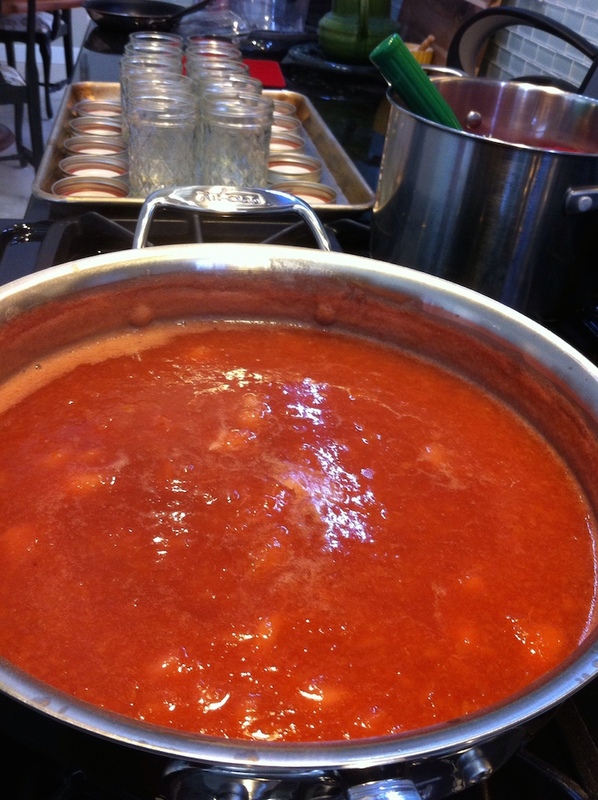 Get all of the ingredients into a large pot to simmer until 'gelled'. Remove the vanilla bean if that's what you used. This is seriously good eating! Yes, you can taste the wine and vanilla in it. 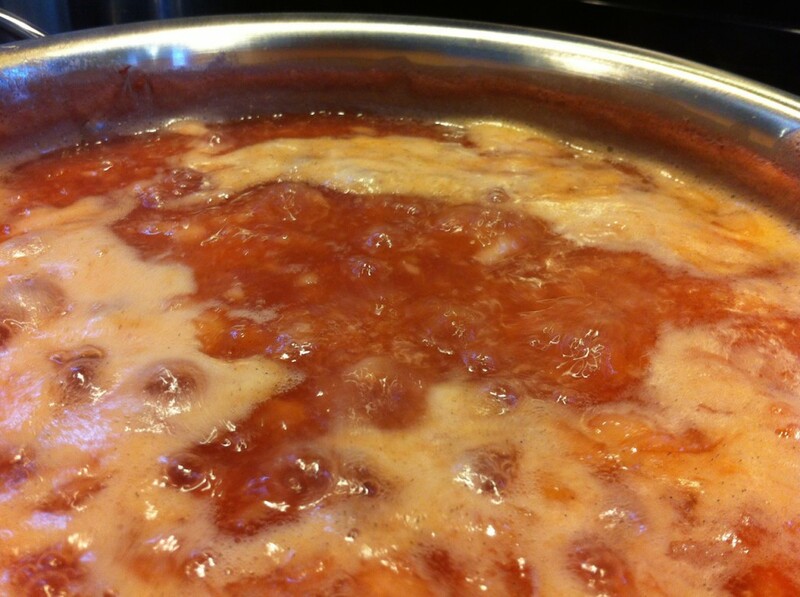 But it is most defiantly a peach jam...only this one doesn't taste like pie filling.